HomeControlled BurnsFire in the Forest: Friend or Foe? We’ve all heard Smokey Bear tell us, “Remember, only you can prevent forest fires.” The Ad Council and the US Forest Service created this slogan in 1947 to warn of the dangers of fire. However, in 2001, and not so well remembered, the slogan was updated. Wait, you don’t remember what it was updated to? Don’t worry, most people don’t either. The quote was changed to, “Only you can prevent wildfires.” So, they just dropped the “Remember?” What’s the big deal with that? That’s how I remembered it anyway. Well, the biggest change was actually a bit more subtle. The keyword used in 1947, “forest fires” was changed to “wildfires.” So, what’s the difference? Well, the difference is in the details. Fire in the forest is not such a terrible thing, it can actually be beneficial. 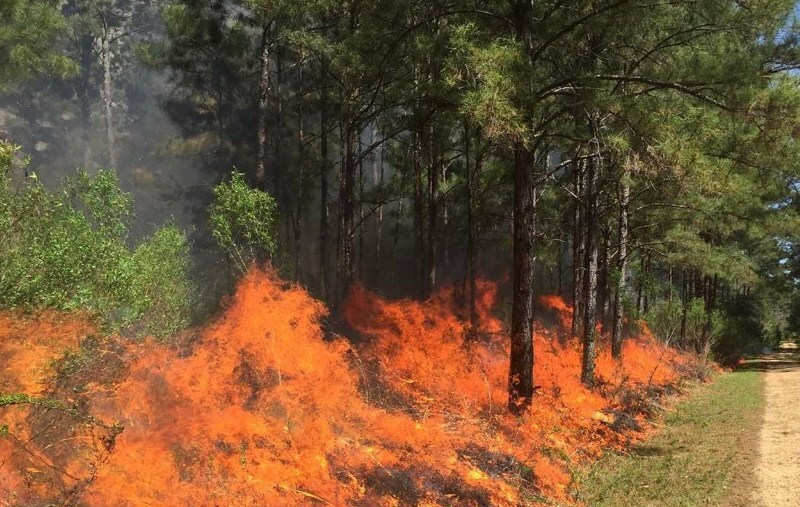 In forest management, we use controlled fire as a means of reducing competitive vegetation in the form of underbrush, bushes, and undesirable tree species. The key word being controlled. The slogan was updated to show that uncontrolled or wildfires are where the danger really lies. This practice of controlled fire, better known as prescribed burning, has a twofold benefit to the forest and forest landowner. First, timber growth and quality are improved, thus improving the overall investment for the landowner. Prescribed burning will remove or significantly reduce woody bushes and brush, small shrub tree species, and undesirable timber species. Removing this vegetation that competes with timber for water and soil nutrients leaves more resources available for timber. Secondly, wildlife habitat is improved. Once woody vegetation, that wildlife can’t utilize as food, is killed by fire, grasses and forbs will begin to grow. These grasses and forbs can be consumed as browse resulting in healthier wildlife populations. Prescribed burning is mostly used in pine plantations or timber stands comprised of predominantly pine species. Reason being, pine trees are resistant to fire. Forest fires are a natural occurrence in many piney forests across the nation. While almost all pines are resistant to fire, some species have adapted to thrive after wildfires. These pine species have cones that will only open and release their seed after a fire has occurred. Hardwood trees, on the other hand, are susceptible to fire events. This isn’t to say they can’t survive a fire, but a particularly hot or slowly moving fire could result in unwanted hardwood mortality. This is where a knowledgeable professional comes into the picture. While a landowner can conduct a prescribed burn on his own property, it isn’t recommended. There are many key procedures that should be followed to ensure a safe and productive burn. If you’re interested in burning, check with your state forestry department to find a list of certified prescribed burn professionals. These professionals, most often Foresters, can help landowners conduct a safe and highly productive burn. By understanding the landowners’ needs and desires, a certified burn professional can prescribe the correct burn, at the correct time of year, and be able to conduct the burn in the correct weather and time of day to effectively eliminate targeted competition. Though Smokey Bear may be in the back of your head next time you see a smoke rising from the woods, try to remember that fire can be a safe, productive, and healthy event for forests, wildlife, and landowners.